Sun May 22: We returned home from a week-end in Padangbai to find the house had been broken into. The burglars forced the back door after climbing over the back wall. They mostly took from the entertainment unit, lso Jamal's walkman, watches, binoculars and John's 20 year old portable short-wave radio and a radio-tape from the kitchen was also taken. Fortunately nothing else was taken. Jamal was quite upset and shaken. 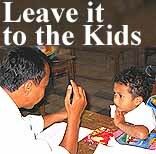 Never wise to leave a house in Indonesia un-attended, now we have learnt the hard way. Bali May 28: Jamal and John left for a 2 week tour of the Malaysian Peninsular. Highlight of the trip will be three days on the 550 kilometer Jungle Railway from Gemas to the northern city of Kota Baru. We will return to Bali Sun June 12.
be present for the arrival of Jamal and John at KL Airport on May 28. The PM said "After all the airport is too bloody far from the city, I haven't got all day to go running out there to meet every tourist. I'm glad they have bought lots of whisky. hard to get here. We get ours from a Queensland And Northern Territory Air Service baggage handler at the airport." What kind of Aircraft was the British R101? The correct answer was an airship or dirigible. 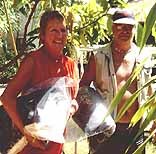 After a break of 4 years, Amsterdam friends Nico and Margriet returned to Bali for a 2 week holiday. While they were here we took them to Padangbai for the week-end. whopping 1.3 mega pixels, has just got it's self a new large memory. I wish I could get one too ... Ed. The ScanDisk memory module holds 256Mb, is enough for 2,900 sparkling, low quality photo's. We also acquired a recharge battery pak, All in the aim of excellence, to give you, our readers the best, low quality, photo's of our upcoming Malaysian trip - all adding to make the KHO News, the unique publication others only dream of. Padangbai Harbour from the hill. 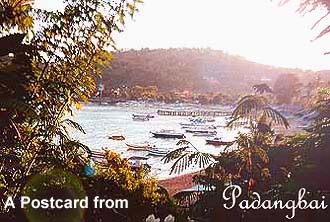 Early May we travelled yet again down to our favourite weekend get-a-away, Padangbai. This time friend Krista from Munich, Germany joined us, her first time, she totally enjoyed and can't wait to return. Sadly most products in Indonesia are of poor quality cheap, simply because it is all the poor can afford. This is false economy because the product must be replaced often. The rich of course can afford imported high quality items. The old adage, the rich get richer and the poor get poorer is still alive and well in Indonesia. The other day my locally made office chair legs simply collapsed. Of course it was probably designed for a 55 kg Indonesian and not for a 80kg westerner. Five large bolts and some glue, the chair was soon repaired - it is definitely now capable of supporting 100 kg+. 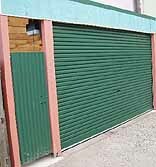 A new two car garage has just been erected, at John's house in Melbourne, it features a side pedestrian entrance and a remote controlled electric roller door. John will paint it next time he is in town. In Indonesia we receive Australian news and programmes from ABC Asia Pacific. The station began transmission early in 2002 on the PanSat 8 satellite. The station is available free-to-air to anyone owning a digital satellite receiver in the Asia pacific region. for Asia pacific Tv, including Asia Pacific News with Whitney Fitzsimmons. Bodyguards, The Einstein Factor, Kath & Kim and Get-a-way. You can check out the ABC Asia Pacific programmes by Clicking Here. Also the station is available from many cable rebroadcasters in the region. The potential audience is billions of people as the satellite footprint covers China, India, Vietnam, Laos, Cambodia, Thailand, malaysia, Singapore, Indonesia, New Guinea and the Pacific Islands. The satellite also carries 2 Radio Australia sound channels. RA English and RA Foreign Language. At the KHO we have a new cleaning and ironing lady, Ketut. She does a great job and loves a joke. Ketut has 2 adult children, sadly her husband died of a sudden heart attack two years ago. Last Sunday Ketut bought her 8 year old adopted daughter along while she worked at the KHO. was not able to look after her any longer. Ketut saved Icha from this situation 3 years ago. Icha never attended school before as her foster mother was too poor to pay the fees, but now Ketut is sending her to Mumhamadia Junior School in Tegal, Denpasar. She is starting from the bottom in class 1. Most warungs (food stalls) across Indonesia serve a dish called Tami Goring. The dish is actually the old Cantonese dish known to westerners as Chow Mein. Basically it is stir fried mixed vegetables, prawn, chicken, pork or fish, or any combination thereof served over deep fried noodles. My favourite Tami Goring was always from the Cirebon restaurant in Ampenan, Lombok. The dish is common throughout Indonesia. However very difficult to find in Bali. Ask most Balinese and they have never heard of it. However it can be found in Denpasar if you go to a Chinese owned restaurant, which tend to be only patronized by Chinese. In the Bali tourist area many restaurants purport to have a Chinese Menu, however I have yet to find Tami Goring being offered. we have at last found an Authentic Tami Goring in Bali, delicious! They have it in the food court at the Chinese Stand in Tiara Grosir, Gatot Subroto, on the cnr of Jl Gatot Subroto and Jl Kerobokan. Blanch noodles in boiling water & let dry, then fry until crisp. Cut red pepper, remove seeds, cut into thin strips. String the snow peas, cut celery into strips. Heat wok, add 2 T'bl S oil. When hot, add the minced ginger, stir-fry briefly until aromatic. Add meat, then water chestnuts. Stir-fry briefly, and add the other vegetables except for the mung bean sprouts. Stir in soy sauce, sugar, and rice vinegar and bean sprouts. make a bed of fried noodles on a plate, arrange stir fry on top and serve immediately. One day an Indonesian teacher asked his class, what is one million rupiah multiplied by two. Budi, a bright kid put up his and and said "Sir, two point two million." The teacher said "Budi sorry that's wrong, it's two million rupiah." "Sir" said Budi objecting, "you forgot about adding corruption"
JAKARTA: Indonesia's tourist industry is expected to contribute about US$6 billion to the nation's income this year, up from only $4.8 billion targeted in 2004, an official said on Thursday. "If the security condition is stable over the next few months, it's not impossible that we'll reach the target" said Minister of Culture & Tourism Jero Wacik. Bali 22 April 1974, 2300 hours, local time Pan Am Flight PA-812 from Hong Kong to Sydney via Denpasar Bali, crashed into a mountain at an altitude of 3000 ft. on approach to the airport with loss of 11 crew and 96 passengers. The subsequent investigation concluded the aircraft took a shortcut to expedite the landing, their Automatic Radio Direction Finder, tuned into the Denpasar beacon became inoperative when it was shielded by a mountain. Following the investigation operators were warned they should encourage pilots towards a more thorough knowledge of the aeronautical information published in the Operations Manual for a certain airport, to avoid the possibility of divided attention during the critical stages of the approach. following year. Developments of the 707-120 include the similar 707-220, the shorter 138 for Qantas, and the stretched 707-320, which flew in July 1959. The 707-120 and 320 were later reengined with JT3D turbofans (in place of the original JT3 and JT4 turbojets) to become the 707-120B, and the 707-320B respectively. 707-320B - Max speed 1009km/h (545kt), max cruising speed 974km/h (525kt), long range cruising speed 885km/h (478kt). Range with max passengers 6920km (3735nm), range with max fuel and 147 passengers 9265km (5000nm). Production of commercial 707s ended in 1978 after 878 had been built. Limited production of military variants continued until 1990. Approximately 130 remain in commercial service today, mostly as cargo aircraft. As much as I wished and preyed the pilot of the Gypsy Moth never asked me to come for a fly. Stillwell to go for a fly in their joint owned Beechcraft Debonair. Finally in 1967 I received my private pilots licence, which I still hold today. Thursday evening to fly to Brisbane. Next morning taking the Folker F-27 service to Longreach, then a small Twin-Otter to Winton. with out a radio. Just submit your flight plan at the public phone at the airstrip, then call again after you had landed. I had an old "Bayside" radio I had taken out of the Cessna when I bought a new one. "You'll go down like Kingsford- Smith" she screamed. I said jokingly "why don't you come along, if we crash you'll know all about it because you will be there". To my surprise she said "I will come." -so I booked a seat for her. I wired it up with 2 x 6 volt lantern batteries and made an antenna from a coat hanger. This I would install on the wing strut of the Auster with sticky tape in order to get into Melbourne. expected. The Auster Aircraft was fabric covered, just like a kids model plane. There was a gaping hole in one side of the fuselage covered with newspaper and sticky tape. The owner apologized that he had hit a sheep the previous day. I knew this was not critical, as after all the Wright Brothers didn't even bother covering the fuselage. We discovered the seats had long fallen apart and were only just ply-wood and the sliding window were missing. No problem in hot Queensland, but would be once we were down south. After a complete pre-take off check and re-fuel we started the aircraft. hung on to the breaks. No way we want to be chased across the paddock by a pilotless plane. windows. The only problem was we could not see out either side. First stop was Barcaldin where we refuelled. On take-off we heard a large bang at the back, the tail wheel tire had blown out. Not to worry, the old Tiger Moths just had a metal skid. We made Charleville by lunch time, ate our sandwiches and refuelled. Rather expensive as they only sold 44 gallon drums and we had to pay for a full one even though we only needed half. We took off and flew to Cunnamulla, on the way the engine started missing and was running very rough, but we were able to maintain airspeed. At Cunnamulla we refuelled an I cleaned all the eight spark plugs. We started up again and the engine ran perfectly. Just before dark we arrived in Bourke where we stayed in a real Aussie Pub. Very colourful, Mum was most amused. civilization, we enjoyed a simple lunch at the aero club. All went well until we were about an hour from Melbourne and the oil pressure dropped. I immediately cut the engine so it would not seize and looked out the window for a suitable paddock to land in. I could not believe my eyes we were right over the top of Mangalore airport. Melbourne's emergency airport before the days of jets. I made a glide landing approach to the airport, notifying the controller on the ground frequency. Private pilots always did that in the old days as they only recorded the tower frequency - that way we would not have to report the incident and suffer an investigation. We landed safely and Mum and I pushed the aircraft in off the runway. The problem was we had just simply run out of oil. The Gypsy Major engine in the Auster was designed to burn oil and that it did. The tower controller came down and found us some oil. Soon we were off again to Moorabbin, where a group of friends were waiting for us. We tied the aircraft down and went to a restaurant to celebrate our safe arrival. I taxied down to the first runway turn off a kilometre down the runway. After owning the Auster for 10 years we finally sold it as the fabric was due for an expensive replacement. The Auster was the favourite of all my aircraft. I had always like the Grumman aircraft since I saw the prototype designed by American Jim Bede in an Aircraft magazine. The aircraft was the first in the world to have the body glued together with composite, hot cured glue, rather than riveted, drastically reducing airflow drag, giving it exceptional performance. One day I say an ad for a second hand AA1-C in the Melbourne Age. Immediately I rang the owner and went out to Colestream airport to see it. I fell in love with it straight away and bought it there and then. The Grumman was totally different to the previous two aircraft, it was high speed and required miles of runway. This was not a bush plane. The Grumman cruised at 220km/h, fast for a single engine airplane. Low on maintenance, perfect to just jump in and fly away. I sold the Grumman when I retired in 1997 after surviving 33 years of memorable fun flying. In the 1980's the Allan Bond enterprise Airship Industries, based in Cardington, UK, the original home of the R101 Airship, produced a much smaller craft the 8 passenger Skyship 500. One of the Skyship was bought to Australia on a demonstration tour. Whilst it was based at Moorabbin Airport, Melbourne. Friend Geoff Currey and I went on a 1 hour flight over Melbourne city. It was a most unusual and unique flying experience. The aircraft cruised at only 1500 ft. The engines were no near as noisy as a light airplane and there was not the vibration af a helicopter, we were just floating along. Due to the slow speed the windows were open and you could lean out into the breeze. Length 423 ft, diameter 105 ft, height 150 ft and a speed of 70mph. The R101 airship was built at Cardington, UK and made her first flight in October 1929. At 777feet in length, she was the largest airship in the world. then cut in half and an extra bay for another gas bag inserted to give more lift. 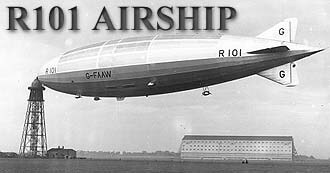 The R101 was seen as a lavish floating hotel. Even by today's standards, the open promenades and public spaces would be seen as unique in the skies. 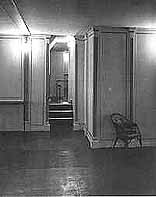 These large British ships were the first to adopt the style of using the interior of the ship for the passenger accommodation. With the R100 and R101, the utilization of interior space was a first of it's kind to be used. 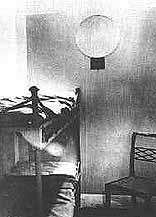 The R101 could boast 2 decks of space, a dinning room which could seat 60 people at a time, and a smoking room which could seat 20. The promenades showed off the view to the fullest advantage. Compared to the noisy smelly and tiring journey in an aeroplane. The Airships were seen as pure luxury, with service compared to that of the greatest ocean liners, but with far faster speeds. The Atlantic could be crossed in 55 hrs. There were a number of minor mishaps on her initial flights including sluggishness and lack of lift. In June 1930 she went into a steep dive for over 500 ft when returning from the Hendon air show. The crew managed to bring her back under control, only to have to deal with a second and a third dive. 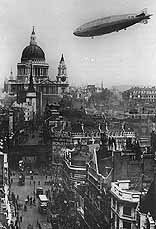 The R101 plainly had significant problems but Lord Thomson, the Secretary of State for Air, insisted that the R101 be ready for a flight to India on the 4th Oct. 1930. Lord Thomson had personal political ambitions in India and wanted to see a regular airship service from London to Karachi, via Egypt. As a result of this pressure, repairs were hurried and the airship patched with a rubber solution. On the evening of 4th October the R101 left Cardington. She carried 42 crew, 6 officials & 6 passengers. A crowd of over 3,000 came to watch the departure. The start of the journey was not propitious; ballast had to be dumped to compensate for over loading, strong winds were encountered and the aft engines broke down. At approximately 2 am the R101 passed over Beauvais, a French city to the north-west of Paris. Already flying at very low altitude she went into a dive and despite all the efforts of the crew she crashed just south of the city. The airship ran along the ground for some distance before being engulfed by flames. Rigger Church, who later died of his injuries three days after the crash, was interviewed and gave the following statement. "I would consider the flight rather bumpy, but not exceptionally so. The second watch had just come on and I was walking back when the ship took up a steep diving attitude. At this moment I received an order to release the emergency forward water ballast (1/2) ton in the nose] but before I could get there the crash came." The emergency ballast was in the very nose of the ship and utilized most of the emergency ballast, it could not be released from the controls in the control car, and had to be jettisoned locally. The R101 came to rest with the forward part of her nose in a wood of small trees and the rest of her hull in a meadow. When getting away from the ship, both Disley and Cook did notice some interesting facts. Disley noted that even though the outer cover was burning, there was almost no cover left on the top of the ship aft of frames 10 and 11. The ship appeared to be a skeleton. Forty eight people died in the tragedy. National feeling surrounding the disaster was huge; the funeral procession through London was watched by thousands. The bodies were then taken by special train to Bedford to be laid to rest in a communal grave in Cardington cemetery. From Competition winner Geof who is retired in Bangkok. from the Airship base at Cardington. There is still a giant hanger there which was built to house the R101 and the others. Until the WW2 there was also the mooring tower but it was pulled down for scrap metal during the war, but I can still just remember it. No, I cannot remember the actual airships, I am not that old!"